This blog entry about the events of Sunday, January 02, 2011 was originally posted on January 08, 2011. DAYS 18-19: Fifteen moai. Six travelers. One stone platform. Take two. “Our sheik is leaving us,” Pattey told the rest of the girls in my “harem.” It was true, it was my last day on Rapa Nui, but I still had all morning to wrap up loose ends, the main one being a photography session of the sunrise at Ahu Tongariki with them, since the plan had been botched the morning before. The colors of the sky were different this time when the sun rose just above the ahu, with more blues peering from behind the clouds — not that it didn’t make for another spectacular show. And if there wasn’t a good show, Pattey was prepared to make it one, this time bringing glow sticks from her bag of tricks. We head back to town after that to return our rental by 9am, but not without picking up a lone hitchhiker on the road (like I had been the morning before), an old Frenchman who had lived on the island for fifteen years. Leigh-Anne translated his words for us as he told his story, how he married a Rapa Nui woman and started a family, and spent his twilight years cleaning up the island to give back to his adopted community. 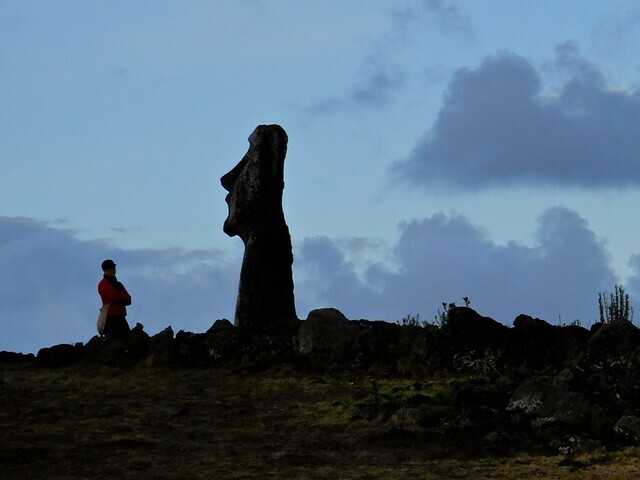 He spoke of the animosity Rapa Nui people had over the mainland Chileans, how the latter are slowly stripping Rapa Nui culture with more and more development, and how all the laws were striving to survive to keep Rapa Nui pure. The island’s relaxed, laid back vibe was soon going to inevitably change though — and in just two days — for 2011 had rung in a new flight schedule of three incoming flights per day (instead of the mere four per week), thus changing Rapa Nui forever. I felt fortunate that I was one of the last tourists to see the magical island before the tourist population would quite possibly outnumber the locals. “EVERYONE THAT I KNOW WHO’S BEEN TO EASTER ISLAND before told me I only needed three days,” I told Leigh-Anne back at Kaimana Inn. “But they probably didn’t make amazing friends like this.” The rest of my Rapa Nui crew still had at least two more days to see the other sites, go on a snorkel or scuba trip (since Hanga Roa was finally fully-functional that Monday morning), go horseback riding, go trailriding on mountain bikes, or just chill out on the beach with a beer. I tried to extend my stay by two days by changing my flights, with no inexpensive luck. “This has been such a wonderful time with such wonderful people,” Pattey said, vocalizing her thoughts to the rest of us. “It has been phenomenal,” Leigh-Anne seconded. After breakfast I only had enough time for a final beer and a walk over to the Hanga Roa post office, where one could obtain courtesy postal stamps in a passport (Rapa Nui is not an independent country after all) as a keepsake and proof for bragging rights. It was after our trip to the post office that I parted ways with the friends I made on the Isla de Pascua, once a group of strangers that I spontaneously went in on a car rental with just after seconds of our introductions. “Make me look like Kristy McNichol, make [Shirley] look like Penelope Cruz, give [Leigh-Anne] Demi Moore’s body, make [Renee] Angelina Jolie, and make…” Pattey asked of me when handling all my photos. She was stuck on a celebrity pair-up for Kati. Kati, my link into the group of which I’ll always think of when I look back at my once-in-a-lifetime stay on Easter Island, wished me farewell, extending an invitation to Finland for ski season. Leigh-Anne invited us all to come out to Stampede in Calgary. And naturally I extended my invitation for everyone to come to New York. “We’re due for a New York trip,” Renee told me. However, earlier that morning she suggested that I should go to L.A. and be their “house boy” since I was so handy with her photography gear. GERTRUDE, THE OLD AUSTRIAN WOMAN that I’d have conversations with at breakfast at Kona Tau was in the airport transport van with me, along with M.J., a Korean elementary teacher from Seoul, on vacation from her graduate program at the University of Kansas. I made friends with them in the van, a connection that continued back at Santiago airport’s baggage claim, and on the public bus into town that followed. I was only in Santiago for a short nighttime layover — just enough time for one last empanada and a sampling of Chile’s other national fast food, the italiano, a hot dog dressed the colors of the Italian flag with guacamole, ketchup, and yet another heaping serving of omnipresent mayonnaise. The next morning, I was back on the bus bound for the airport, where I took an uneventful flight back to New York via Panama City — making a grand total transit time of 38 hours since I stood on the tarmac at Easter Island. “You want to go to the lounge?” I asked her in Panama City. I used my American Express Platinum membership privileges to get a guest into the Presidents Club for the long, three-hour layover (making the American Express plug in this trip blog come full circle). The time flew by with the open bar, snacks, and good conversation, and it was a sort of Up In The Air moment. We parted ways seven hours later at the taxi stand back at JFK, our gateway back into the cold, wintery realities of our New York lives. Fortunately, the culinary diversity of the Big Apple could perhaps transport us back to a place we’d just traveled through. “Let me know if you want to grab some Chilean fish stew sometime,” she asked me. IF THE UNDERLYING THEME of my Asian trip blog was culinary, and the theme of my Israel trip blog was religious and political, then this Chile trip blog’s theme is definitely social. Looking back, what stands out most to me on this trip are the people I met on the way. The world is full of amazing — and funny — people, and they always seem to conveniently pop up at just the right time (usually in airports) for the adventure to unfold. This is the most exciting part of unscheduled independent travel for me, watching characters develop in exotic settings, where you don’t know what’s going to happen next. It’s sort of like being the protagonist in your own movie that you’re watching and experiencing for the first time. I’d made a lot of friends on this trip through Chilean cities, Mendoza vineyards, Patagonian hiking trails, and Easter Island shores. Sure I had known Emily from home for the first part of the trip — a trip that only bonded us tighter and introduced me to Ina — but the other people were new, and yet familiar at the same time. John, Florin, and the rest of our international gang were like-minded people, quick to make quips about the events going on. The fortunate meetings with Kati, Pattey, Renee, Shirley, and Leigh-Anne only added to my enjoyment of the overall trip. Perhaps it is the circumstances that one is placed in while traveling which make instant friendships so easy — much easier than it is back at home — for everyone is bonded by a love of travel and a curiosity of the world. And many others. Some I knew for a day, some for months. Some I still talk to, some are merely thumbnails on my Facebook page. Some I have no correspondence with whatsoever. But I’ll never forget these people for they have collectively shown me that, as BootsnAll.com founder Sean Keener once put it, “it’s not a lonely planet.”* When you travel alone, you’re never really alone, because there’s always going to be someone just like you there, willing to make lifetime memories and share the experience with you. *Unfortunately, BootsnAll’s lawyers nixed Sean’s clever double-entendre as an official slogan. more great pics of the moais! just finished reading the entries. great blog as always! Hey gang. It’s been a while eh! I haven’t been “working” in a cube farm for a while now. I’m on a long term experience in France. I’m finally on Twitter, so I’m going to miss anymore GlobalTrips. I’m catching up as you’re reading this Erik. Td0T: HEY! What’s up? Welcome back… how’s France? hey! it’s cool, the food is good. I’m in Lyon, near the Alps so plenty of Snowboarding… Learning a ton o’French and listing to sirens that sound like children’s play things. I’m starting to miss Toronto though. Let me know next time you stopover in Europe.